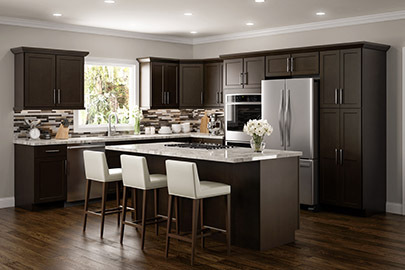 There are many different kinds of granite that vary in price. We have a large selection of granite available from all grades. Contact Us today at (630) 771-0100 to discuss your options. 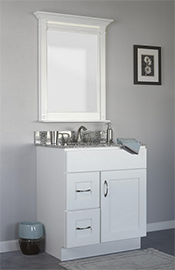 Want the quality and durability of custom cabinets without the excessive cost? We do too, that’s why we created our Designer Collection of cabinets. With standard features like dovetail constructed drawer boxes and soft close hinges, you’ll be wondering why they don’t cost more! The same quality, durability and value found in our Designer Kitchen Collection, but for your bathroom. Whether you’re looking for a vanity to go hand in hand with your kitchen design or to set itself apart, JSI has the style for you. 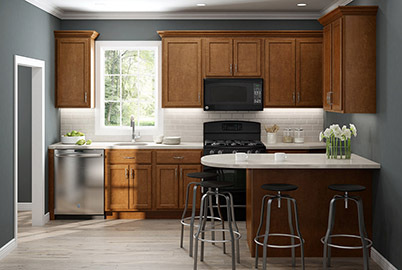 Now, you can have exceptional value and design flexibility with JSI’s Premier collection: Amesbury, Quincy and Plymouth. Amesbury and Quincy are available in Brown, Cherry, Golden and Espresso stains and new Plymouth is fashionable white paint. 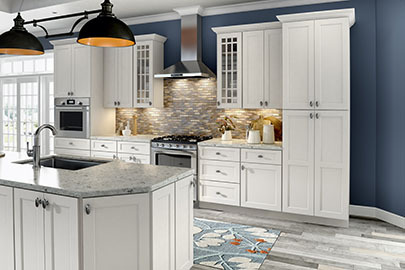 The Premier collection features an expanded cabinet and molding assortment giving you true custom design at an exceptional value.